With Bishop T.D. Jakes' help, fans of his book Destiny can break free from everyday distractions to restructure their priorities and discover their destiny. For those who sense an order to their steps, a form of guidance nudging them forward, this companion guide is the key to success. The DESTINY PERSONAL APPLICATION GUIDE offers interactive questions, creative exercises, and strategies that will challenge readers to get to know themselves even further. 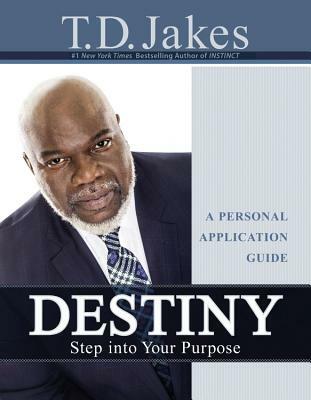 Readers will find the courage to claim their destiny and focus on reaching the goals God has set for them. This guide is filled with reflections, self-quizzes, and other interactive applications, encouraging readers to live an intentional, satisfying life. T.D. Jakes is a #1 New York Times bestselling author of more than 25 books. His television ministry program The Potter's Touch is watched by 3.3 million viewers every week. He has produced Grammy Award winning music and such films as Heaven Is For Real, Sparkle, and Jumping the Broom. A master communicator, he hosts Megafest, Woman Thou Art Loosed and other conferences attended by tens of thousands.